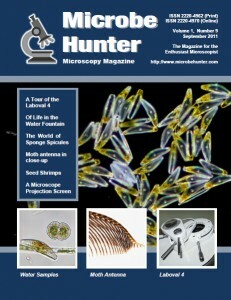 Welcome to the 9th issue of MicrobeHunter magazine. You can download the PDF and order a printed version. You do not need a pond in order to observe pond microorganisms. Sometimes a forgotten water fountain will do as well. Sponge spicules make up the skeleton of sponges. They are useful for sponge classification. Projection screens allow for a more relaxed viewing, but they also have some disadvantages.